Born in Buffalo (New York) in 1960, Mike Terrana began playing in clubs in the 1970s in different styles, and moved to Los Angeles in 1987, which was the center of the Heavy Metal in the world at that time, to play with experts as Yngwie Malmsteen and Tony Mac Alpine (who also played with Dennis Chambers and Virgil Donati). 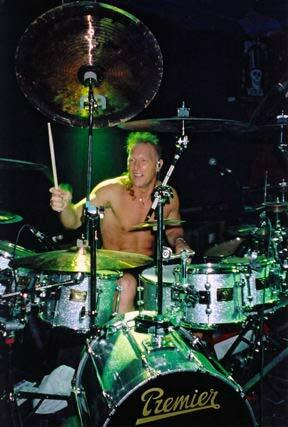 A pioneer and still one of the greatest drummers of "Extreme Metal" (hear: extremely fast, powerful, enduring or complex), he has since moved to Germany in 1997 to play in different metal bands, today numerous and popular in this country and in nearby Scandinavian countries. At ease in fusion (improvisation, pure instrumental, sometimes with Brazilian or jazz connotations (listen to "Something's cooking" of " Tabbo Voodoo" trio with the French Cyril Achard and Franck Hermanny)) as metal (song in the "power prog melodic metal" style), Mike has become a must-drummer of these two scenes playing with a pretty incredible amount of different musicians also considered to be the best by experts (mostly electric guitar virtuosi from the metal). His playing with the double bass drum in coordination with the hands is a model of he genre and pushes the art of virtuoso drumset drumming to summits difficult to exceed: complex and inventive (asymmetrical measures, polyrhythm, melody, ornamentation with feet, triplets, breaks beats , ghost notes, improvisation, etc. ), fast, and powerful (he practices bodybuilding and masters all the advanced gestural techniques like alternating strokes (see my lesson on this website)). He currently plays with his own fusion band and regularly gives master classes around the world.